The UIS History Harvest is a collaboration between students from Dr. Devin Hunter’s undergraduate Public History class and Dr. Ken Owen’s graduate History and Digital Media class. Over the course of two Harvests, in 2016 and 2018, the public shared with us their photographs, artifacts, documents, and memories under the inaugural theme on elections and politics and the second theme of "Being Illinoisan." Students digitized items, and continue to contribute images and information to this online archive and exhibit space. The goal of this History Harvest is to democratize and widen our understanding of the electoral process. Though elections are celebrated as giving voice to the people. 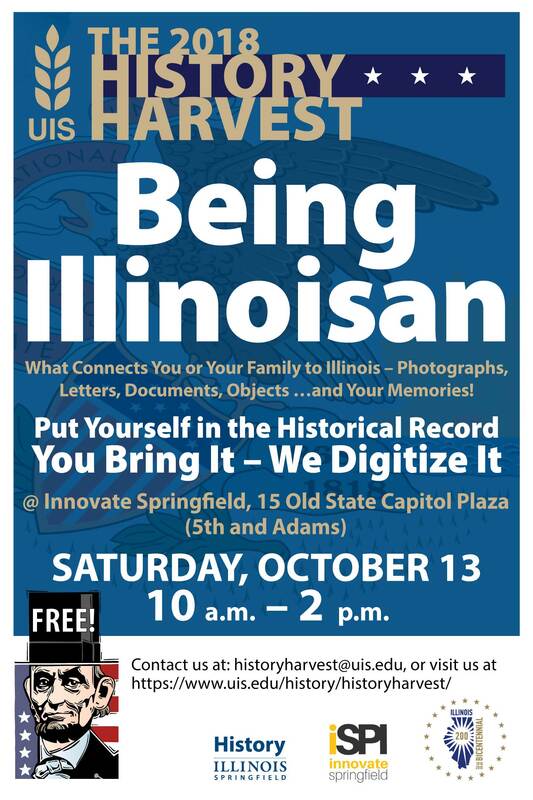 By collecting information on the historical memories of the local people, this History Harvest provides a unique insight into how ordinary citizens in central Illinois have participated in and remembered historical events large and small. The UIS History Harvest is part of a national movement connecting communities and universities through the practice of local history. More background on the national movement can be found here. For more information on the UIS History Harvest, see our Frequently Asked Questions page.